US, 1984, 103 minutes, Colour. Peter Weller, John Lithgow, Ellen Barkin, Jeff Goldblum, Christopher Lloyd, Rosalind Cash, Lewis Smith, Matt Clark, Clancy Brown. The Adventures of Buckaroo Banzai Across the Eighth Dimension is an oddball science fiction fantasy. Written by Earl Mac Rouch, it is a lavishly produced send-up of so much of the Star Wars and Indiana Jones types of film. The re-creation of places and decor, the mixture of cultures, the strange assortment of characters mean that the whole film is quite unpredictable. It is its zany screenplay as well as the oddball characters and situations which have made the film something of a cult success. The hero is well-played by Peter Weller (who was soon to become Robocop). John Lithgow enjoys himself as Dr Emilio Lizardo as well as the menacing villain Lord John Whorfen. Ellen Barkin is a pleasing heroine. There are guest character parts from a wide range of actors including Jeff Goldblum, Christopher Lloyd, Lois Smith and Matt Clark. The film looks at the type of entertainment that has become popular from the late '70s into the '80s, the flights of the imagination, the strange kinds of connections. Comic strip material that might not appeal to all - but definitely those who are fond of the offbeat. Direction is by prolific screenwriter W. D. Richter. 1. An enjoyable science fiction film? Fantasy? Spoof? Cult film? 2. The re-creation of a particular world? In which dimension? Planet Earth and the familiar and the unfamiliar? The atmosphere of scientific experimentation? Other planets? The importance of the special effects and sets and decor? The stunt work? The musical score for atmosphere? 3. The title and its focus, tone, significance? Audience expectations? 4. 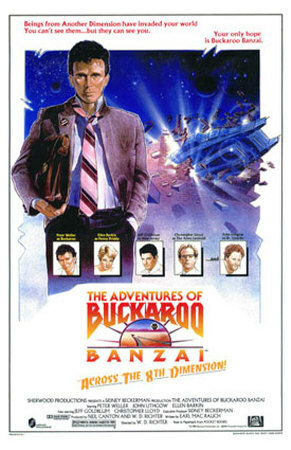 The focus on Buckaroo Banzai, his Japanese- American background, a genius, particle physics, neuro-surgery, his love for rock and roll? His work on an operation for an Eskimo, The jet-car trials? The Oscillation Overthruster? His associate Hikita? Driving through the mountain - into the 8th dimension? The gate into the real world for the invaders from Planet Ten? The red lectroids? His confrontation with Lord John Whorfen? His taking possession of Dr. Lizardo? The rock gig, Penny Priddy and her relationship with Banzai's wife? her wanting to commit suicide and his stopping her? The emissary from the black lectroids of Planet 10? The message to Buckaroo? The threat about World War Three? Planting Lord John Whorfen not to return home? The question of the Overthruster and the attack on the headquarters? The kidnapping of Penny, torture, Buckaroo and his associates, the Hong Kong Cavaliers, the assault on the Propulsions System? The attack on the factory, the rescue of Penny, Whorfen taken away in the space ship? Buckaroo and his flight, the attack on Whorfen? Into the 8th dimension? Comic book hero, comic book adventures, tongue-in-cheek? 5. Lord John Whorfen as the evil villain, possessing Dr. Lizardo's person? His coming from Planet 10? His evil plans? The confrontation with the scientist? The lectroids and their not wanting him? His confrontations with Buckaroo? His going into the Overthruster? His destruction? John Lithgow's enjoyable hamming as the cartoon villain? 6. Penny Priddy, a similarity to Buckaroo's wife, her depression, wanting to attempt suicide in the nightclub? Rescued by Buckaroo? Her being kidnapped by the red lectroids, the torture? The Overthruster being in her handbag? Her rescue? The happy ending? 7. The comic gallery of characters: New Jersey and his work as the cowboy brain surgeon? Perfect Tonmy and his appearances, the blonde? The drawling scientist? Reno, Nevada? John Big Boote? 8. The political background, the Secretary of State, the Congress members, the Senator? The comment on American politics and scientific investigation? 9. The visual humour? The appearance of the locations and characters? The nightclub? The rock groups? The verbal humour - especially about the hypnotising of Orson Welles in 1938 for The War of the Worlds? The farce? The build-up to the spoof on the space epics? An enjoyable cult film?